• A food allergy is an adverse immune response to a food protein. Food allergy is distinct from other adverse responses to food, such as food intolerance, pharmacologic reactions, and toxin-mediated reactions. • With a food allergy, the body reacts as though that particular food product is harmful. As a result, the body's immune system (which fights infection and disease) creates antibodies to fight the food allergen, the substance in the food that triggers the allergy. • The next time a person comes in contact with that food by touching or eating it or inhaling its particles, the body releases chemicals, including histamine, to "protect" itself. These chemicals trigger allergic symptoms that can affect the respiratory system, gastrointestinal tract, skin, or cardiovascular system. These symptoms might include a runny nose, an itchy skin rash, a tingling in the tongue, lips, or throat, swelling, abdominal pain, or wheezing. 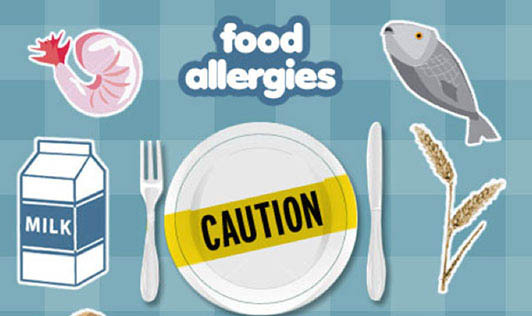 • Milk, egg, soy, wheat, shellfish, peanuts and sesame seeds are the most common foods that cause allergies. So avoid them if you allergic. • The mainstay of treatment for food allergy is avoidance of the foods that have been identified as allergens. For people who are extremely sensitive, this may involve the total avoidance of any exposure with the allergen.